Are you ready to see Satoshi Nakamoto with your own eyes and make a selfie with him? Don’t make your friends nervous, while scrolling your social page. Take your mates and come to have fun! We are pleased to invite you to grand opening of the virtual monument to Satoshi Nakamoto. 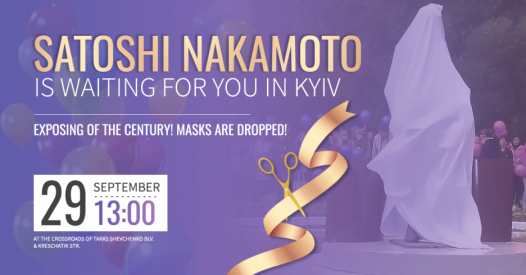 September, 29, 13:00 p.m. Kyiv time, join us and celebrate the grand opening of the virtual monument to Satoshi Nakamoto, the symbol of freedom and decentralization of the society. Venue: at the crossroads of Taras Shevchenko boulevard & Kreschatik street. This day will become the significant event in history, the beginning of new era of virtualization of modern cities. Exciting contests, gifts and food court are waiting for you. Let us remind you, that Kyiv’s virtual monument to Satoshi Nakamoto is the first one, to be constructed within the program of Augmented reality cities foundation under the aegis of Satoshi Nakamoto Republic. Funds, for the first virtual monument installation were backed by the initiator of the project, Alexander Soroka, LI. By the end of 2018 two other virtual prototypes of Satoshi Nakamoto will be launched in the USA. The idea of creating new monuments emerged as a result of partnership between Satoshi Nakamoto Republic and Younk, the first community music label on blockchain. Pavlo Yelizarov and Andrey Dakhovskyy became the founders of Los Angeles and Miami virtual monuments. Be patient, and soon we will introduce you the new incarnations of Satoshi!